The production of multi-color stamps is now easier than ever. 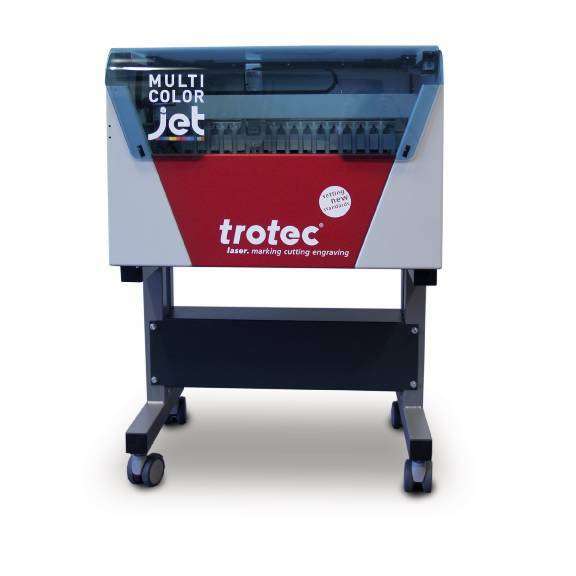 With the Multi Color Jet, Trotec and Trodat have streamlined the multi-color stamp production process. While your Trotec laser engraves the stamp text plate, the Multi Color Jet inks the ink cartridge (stamp pad), previously cut using the laser. Because both procedures are being performed simultaneously, you get more done in less time! The Multi Color Jet is available with all 15 colors of the multi-color spectrum, with all colors permanently installed in the Multi Color Jet... With no need to retool! Design the multi-color impression in your favorite graphic software. 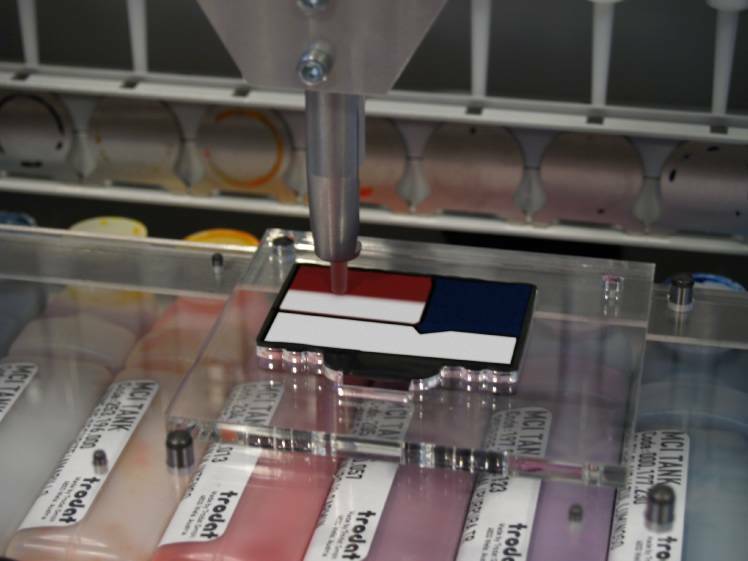 Once complete, the Multi-Color Check software will automatically check and confirm that the chosen impression is feasible to produce. 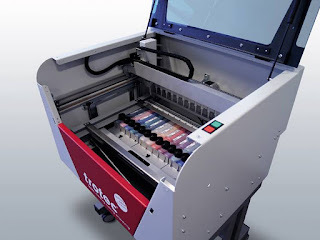 With one click, your laser will automatically generate three production jobs; (1) The laser cutting of the multi-color ink cartridge, (2) the job for inking the ink cartridge, and (3) the laser engraving job for producing the stamp text plate. Place the multi-color ink cartridge in the positioning tray and place inside the laser. Your Trotec laser will quickly and precisely cut the respective segments of the ink cartridge according to the impression design. 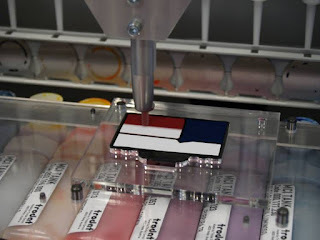 Once the laser has completed the cutting process, remove the tray from the laser and place it inside the Multi Color Jet. While the Mutli Color Jet is inking the ink cartridge, place the text plate inside your laser and begin the engraving process. You have now completed a Trodat stamp with your own personalized multi-color impression quickly, cleanly, and efficiently! To learn more about our Multi Color Jet or see it in action, please visit our website. I would like to know what Advantages the Multi Color Jet can bring to my organization! Over to you: How do you think owning a Multi Color Jet would benefit your stamping production? What other machines would you like to see develop in order to help you, our customer, work more efficiently?